Last edited by bystander on Sun Sep 02, 2012 11:53 pm, edited 1 time in total. 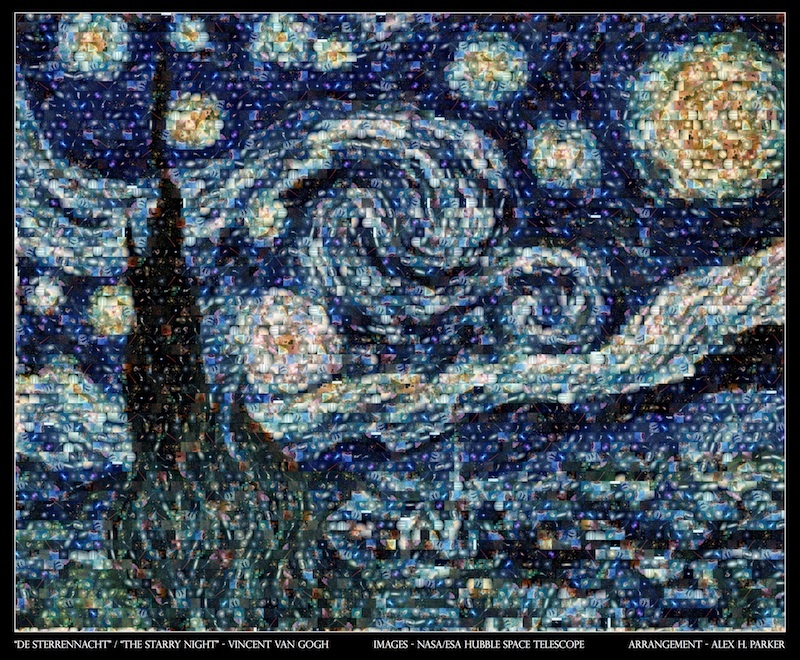 A re-imagining of Van Gogh's "The Starry Night" using the "Top 100" Hubble Space Telescope images (collected from http://www.spacetelescope.org/images/archive/top100/). Last edited by alexhp on Mon Sep 03, 2012 1:11 am, edited 2 times in total. Great Starry Night image Alex. I hereby dub thee Pixelator Extraordinaire. Last edited by bystander on Mon Sep 03, 2012 4:00 am, edited 1 time in total. 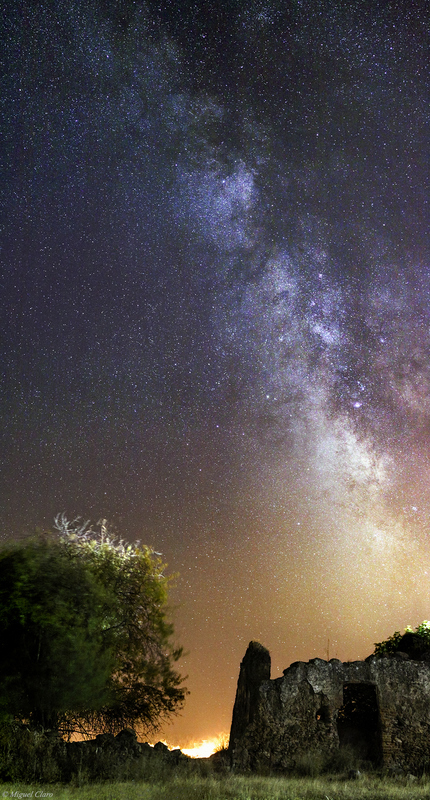 Just before the dawn on last August 18th, there were lots of bright stars gathering in the eastern sky. Not only the bright stars in winter constellations, such as Capella, Aldebaran and Betelgeuse, but also the brightest planet Venus and the king of the planets Jupiter, who were dancing with them. Lots of deep-sky objects, such as Pleiades, California Nebula and the Double Cluster, interspersed among those bright morning stars. Even the winter milk way can barely be seen in this picture. My friend stood on hill, waiting for the dawn. Last edited by owlice on Mon Sep 03, 2012 9:33 am, edited 1 time in total. Reason: Attached image, as hotlink didn't work; left link. This is lovely; thanks for sharing! 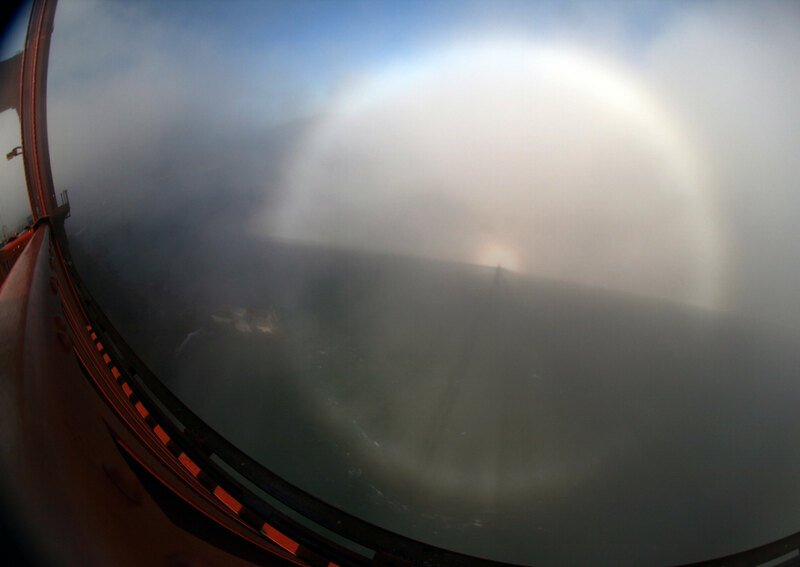 After seeing it for real, I realized its apparently all generated by a "fata morgana" mirage, atmospheric lensing layers etc, although I'm still not sure why it changes color at the top. Not sure if this qualifies as APOD-worthy but I found it fascinating. Last edited by jkg on Tue Sep 04, 2012 12:02 am, edited 2 times in total. 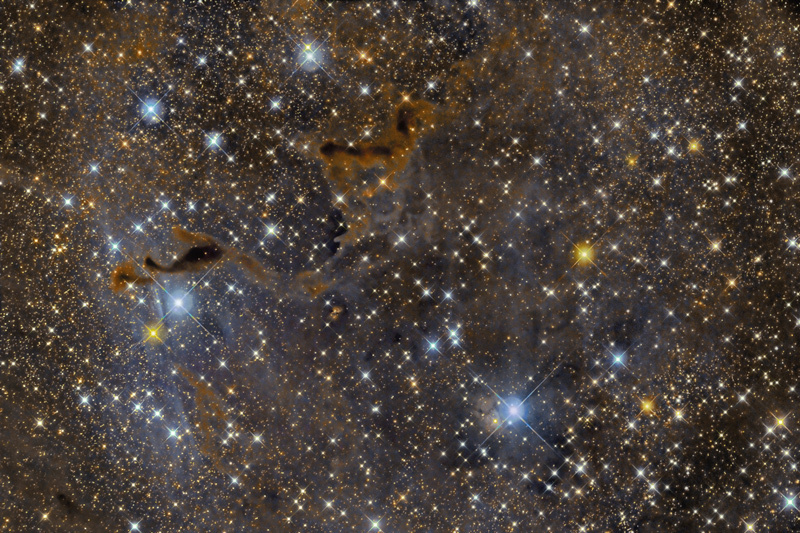 But I really want to talk about Stephane Zoll's picture of Outters4, a newly discovered faint OIII-emitting nebula inside relatively bright Ha-emitting nebula Sharpless 129. What a fascinating nebula! Is it a planetary nebula? It looks rather like it, but if so, where is the central star? The nebula is centered on a bright blue star, which is, however, not the kind of star you find inside planetary nebulae. 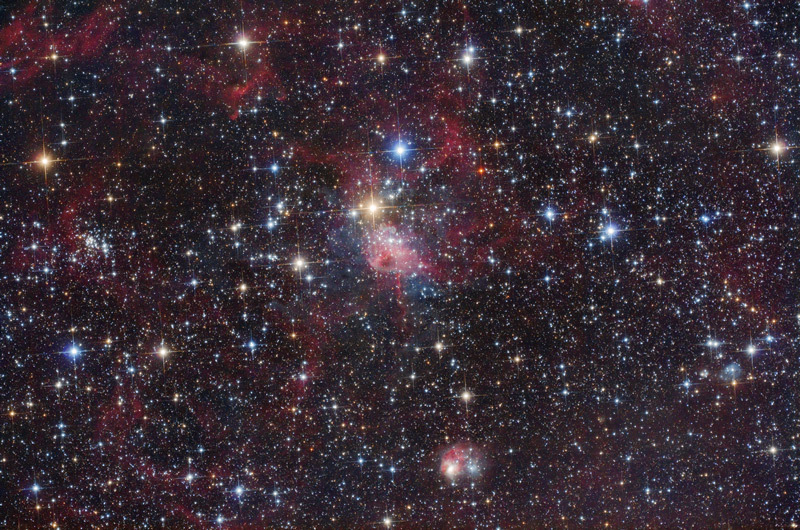 The star, HD 202214, is classified alternatively as B0V, B0IV, B0II and O9. My software suggests a V light luminosity of about 8,000 times that of the Sun. The spectral class and V light luminosity makes HD 202214 too cool and bright to be the central star of a planetary nebula. On the other hand, HD 202214 is clearly a remarkable star in itself. Its temperature and V luminosity appears to be comparable to that of great star Alnitak in Orion's Belt, but since Alnitak appears to be farther along in its evolution than HD 202214, the latter star might become a brighter blue star than Alnitak. My point is that a hot massive star like HD 202214 might possibly have some sort of outburst or its own, just because it is so massive. Particularly if it is at the end of its main sequence lifetime, which seems likely. But HD 202214 also has a companion. My software seems to contradict itself as to how bright the companion is compared with HD 202214 itself. But if the companion is faint, isn't it possible that the companion is in fact a small hot star which has produced a planetary nebula? It is a really strange nebula, in fact no one knows what it is exactly at the moment but it is being studied right now! It is likely to be something other than a planetary nebula, there has been some professional speculation that it might be the first known Milky Way analogue of a giant stellar jet from a symbiotic star in the LMC (which was discovered last year: http://arxiv.org/abs/1111.0848). It might be a completely new class of object! One thing is certain, it will continue to be studied for years to come! I wonder what else is out there that's waiting to be discovered! Hi: I shot this image of NGC6914, a tangle of nebulae and stars in the heart of Cygnus, between July 24 and August 25. 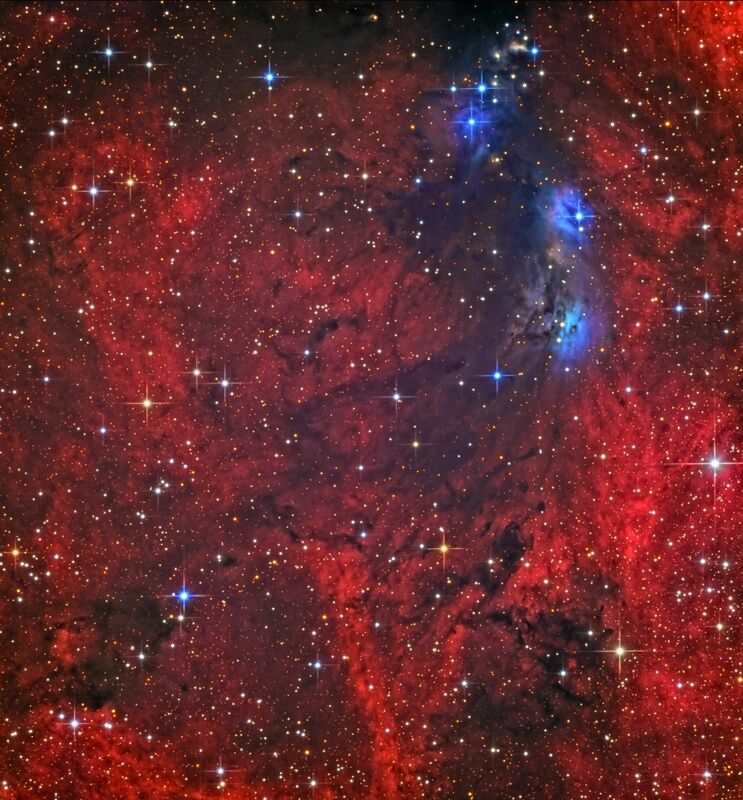 A brilliant blanket of red emission nebulae encompasses an intricate web of reflection nebulae of varying shades of blue, with the field shot through by stars of many vivid colours. Towards the middle of the frame the blue nebula fades gradually in colour and intensity, giving way to very dark clouds in an apparent transition that seems almost unique in the sky! 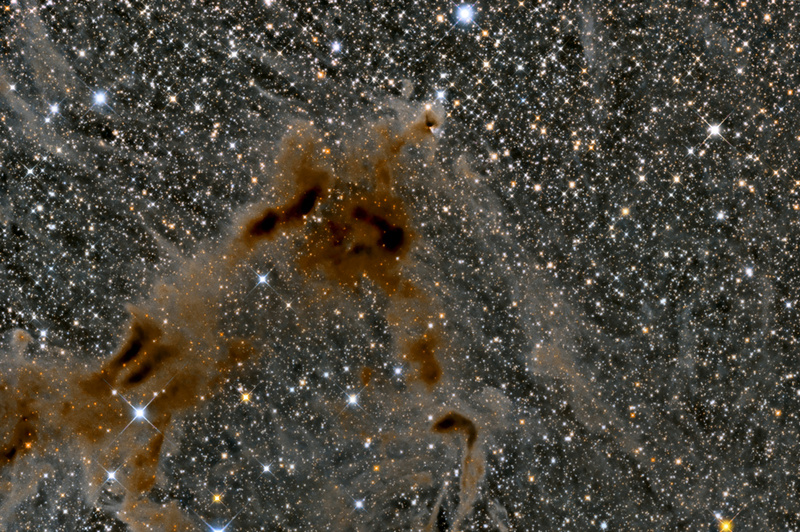 This image is the result of 15 hours of exposure in a PlaneWave Instruments CDK17, using an Apogee U16M camera equipped with Astrodon filters, riding atop a Paramount ME, guided by a Starlight Xpress Lodestar camera together with an Astrodon MOAG, and housed in the roll-off roof Cabin in the Sky Observatory, which is located under the deep, dark, and dry skies of the south Okanagan region of British Columbia. Exposures were: 200 minutes in luminance (unbinned); 170 mins in narrowband Ha (unbinned); and 130 mins red, 140 mins green, and 260 minutes blue (all colours binned 2x2). Image capture was done with ACP, TheSky X, MaxIm DL, and Focusmax. Processing was done with PixInsight and CCDInspector. The image above is downsampled X2 from the (slightly cropped) original 16 Megapixel version. Last edited by htrottier on Mon Sep 03, 2012 9:26 pm, edited 2 times in total. Solar Disk in Ha on September 2, 2012. 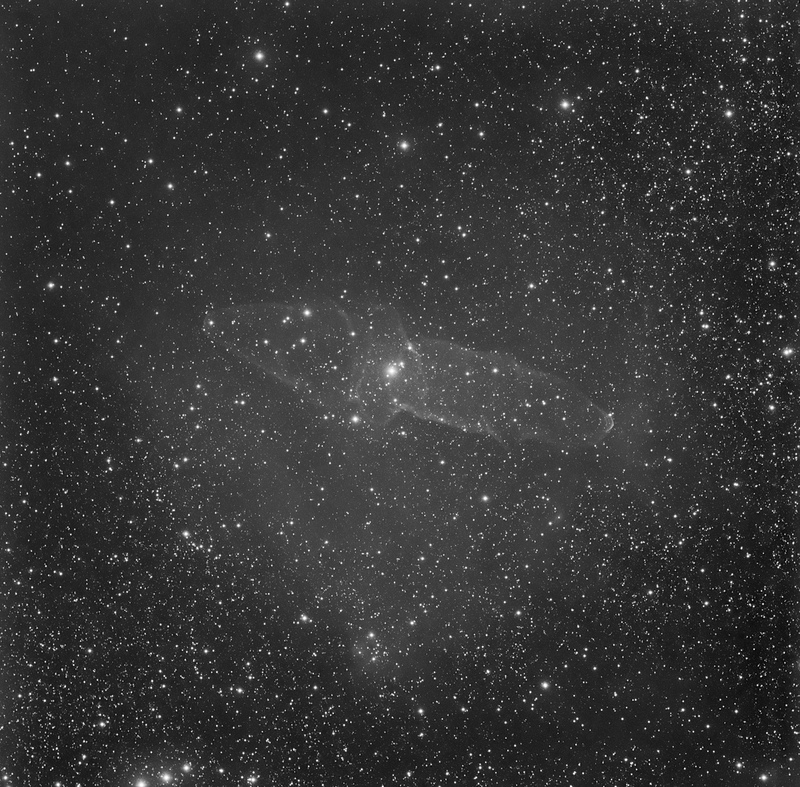 Imaged wtih a Lunt 100 Ha telescope, doublestacked with a Coronado 90 filter. Last edited by JimLafferty on Tue Sep 04, 2012 3:45 am, edited 2 times in total. For details please check the website, bigger size available here. 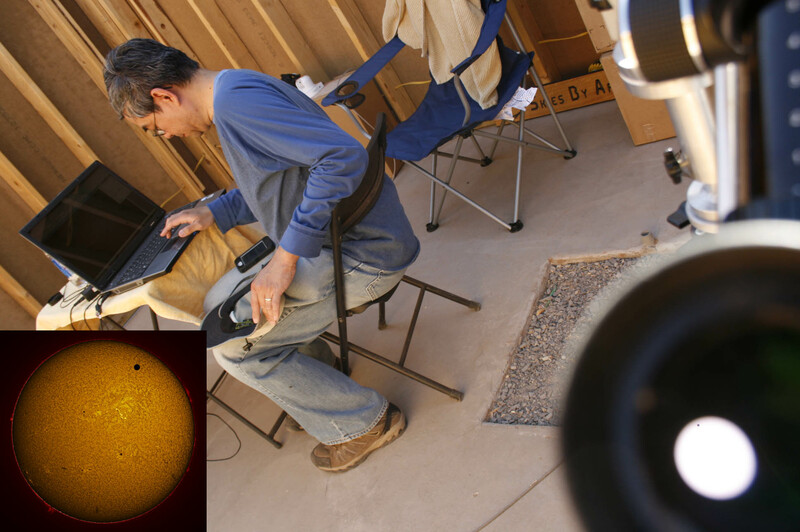 My wife and I travelled to our remote observatory in New Mexico to view and image the Venus transit. I imaged the Venus transit using my Hydrogen-Alpha setup, but in the meantime my wife imaged the event using a hand-held Canon DSLR shooting afocally through the eyepiece of a small white-light-filtered telescope. Unbeknownst to me, as I was busily gathering data for my H-alpha images (sample shot in the inset at the lower of this composite image), she composed this killer (to me!) shot: she was able to capture the transit afocally (the white disk with the little black dot) at the lower right of the frame, while also capturing me as I was busily gathering data. She likes to think of this shot as a time capsule of the technology used to capture the transit: visible in the image is my iPhone at my lap, as I was using its countdown timer to remind me when to shoot the next exposure in my sequence. Also visible in the image is the laptop I used to capture the data from the webcam used for data grabbing. We wonder what this snapshot of history might look like to those viewing the next transit 105 years from now. We're hoping that by then, there may be people living on Mars, either already having see or looking forward to a transit of the Earth and Moon of the sun! 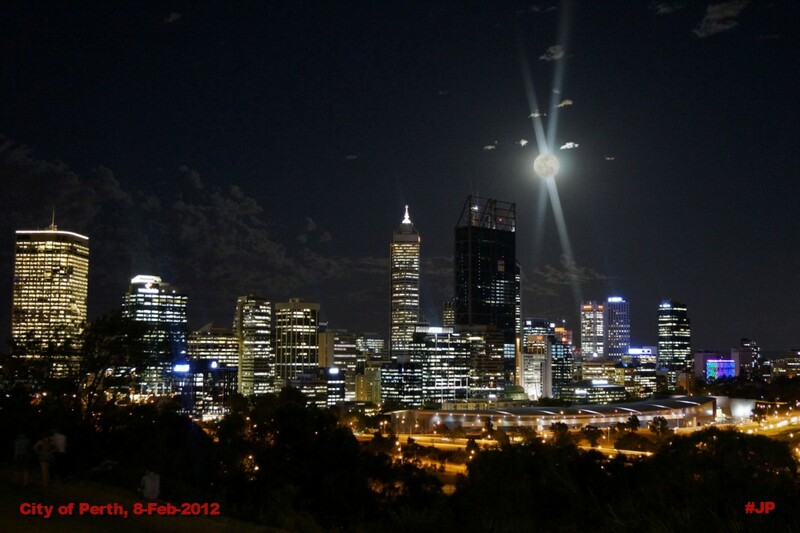 City of Perth at night + full MOON ..
Last edited by f.lorand on Wed Sep 05, 2012 11:09 am, edited 2 times in total.